Few fields have been opened up the exploration of which has proved as fruitful as that of high frequency currents. Their singular properties and the spectacular character of the phenomena they presented immediately commanded universal attention. Scientific men became interested in their investigation, engineers were attracted by their commercial possibilities, and physicians recognized in them a long-sought means for effective treatment of bodily ills. Since the publication of my first researches in 1891, hundreds of volumes have been written on the subject and many invaluable results obtained through the medium of this new agency. Yet, the art is only in its infancy and the future has incomparably bigger things in store. From the very beginning I felt the necessity of producing efficient apparatus to meet a rapidly growing demand and during the eight years succeeding my original announcements I developed not less than fifty types of these transformers or electrical oscillators, each complete in every detail and refined to such a degree that I could not materially improve any one of them today. Had I been guided by practical considerations I might have built up an immense and profitable business, incidentally rendering important services to the world. But the force of circumstances and the ever enlarging vista of greater achievements turned my efforts in other directions. And so it comes that instruments will shortly be placed on the market which, oddly enough, were perfected twenty years ago! These oscillators are expressly intended to operate on direct and alternating lighting circuits and to generate damped and undamped oscillations or currents of any frequency, volume and tension within the widest limits. They are compact, self-contained, require no care for long periods of time and will be found very convenient and useful for various purposes as, wireless telegraphy and telephony; conversion of electrical energy; formation of chemical compounds through fusion and combination; synthesis of gases; manufacture of ozone; lighting; welding; municipal, hospital, and domestic sanitation and sterilization, and numerous other applications in scientific laboratories and industrial institutions. While these transformers have never been described before, the general principles underlying them were fully set forth in my published articles and patents, more particularly those of September 22, 1896, and it is thought, therefore, that the appended photographs of a few types, together with a short explanation, will convey all the information that may be desired. The essential parts of such an oscillator are: a condenser, a self-induction coil for charging the same to a high potential, a circuit controller, and a transformer which is energized by the oscillatory. discharges of the condenser. There are at least three, but usually four, five or six, circuits in tune and the regulation is effected in several ways, most frequently merely by means of an adjusting screw. Under favorable conditions an efficiency as high as 85% is attainable, that is to say, that percentage of the energy supplied can be recovered in the secondary of the transformer. While the chief virtue of this kind of apparatus is obviously due to the wonderful powers of the condenser, special qualities result from concatenation of circuits under observance of accurate harmonic relations, and minimization of frictional and other losses which has been one of the principal objects of the design. Broadly, the instruments can be divided into two classes: one in which the circuit controller comprises solid contacts, and the other in which the make and break is effected by mercury. Figures 1 to 8, inclusive, belong to the first, and the remaining ones to the second class. The former are capable of an appreciably higher efficiency on account of the fact that the losses involved in the make and break are reduced to the minimum and the resistance component of the damping factor is very small. The latter are preferable for purposes requiring larger output and a great number of breaks per second. The operation of the motor and circuit controller of course consumes a certain amount of energy which, however, is the less significant the larger the capacity of the machine. Fig. 2 illustrates a small oscillator designed for certain specific uses. The underlying idea was to attain great activities during minute intervals of time each succeeded by a comparatively long period of inaction. With this object a large self-induction and a quick-acting break were employed owing to which arrangement the condenser was charged to a very high potential. Sudden secondary currents and sparks of great volume were thus obtained, eminently suitable for welding thin wires, flashing lamp filaments, igniting explosive mixtures and kindred applications. 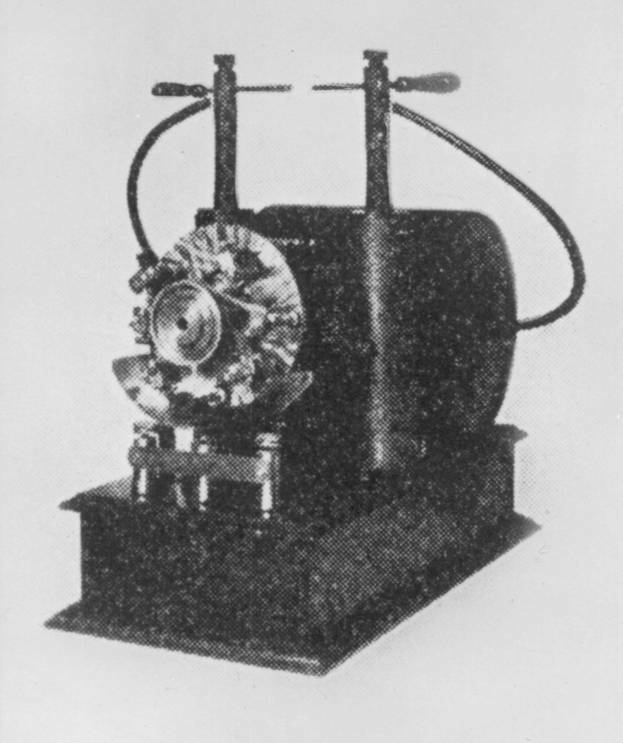 The instrument was also adapted for battery use and in this form was a very effective igniter for gas engines on which a patent bearing number 609,250 was granted to me August 16,1898. Fig. 4 is a photograph of a type of transformer in every respect similar to the one illustrated in the May, 1919, issue of the Electrical Experimenter to which reference has already been made. It contains the identical essential parts, disposed in like manner, but was specially designed for use on supply circuits of higher tension, from 220 to 500 volts or more. The usual adjustments are made in setting the contact spring and shifting the iron core within the inductance coil up and down by means of two screws. In order to prevent injury through a short-circuit, fuses are inserted in the lines. The instrument was photographed in action, generating undamped oscillations from a 220 volt lighting circuit.